Diderot was one of the three genius philosophers of the French Enlightenment. Probably without them the king, the aristocracy, and the Catholic Church would have lorded over the people for another half century. Along with Voltaire and Jean-Jacques Rousseau he laid the intellectual groundwork for the Revolution of 1789. The Revolution produced the Declaration of the Rights of Man profoundly influenced by the three men. Napoleon later adopted it and ordered everyone of his troops to carry in his knapsack. Through the likes of Thomas Paine, American ideas, evolving from the Bill of Rights of 1776, had been transmitted to France. In fact it was a much better and richer document—in literary style and the directness of its content. 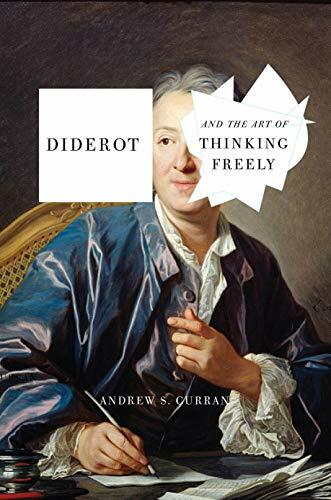 In this book Andrew S. Curran, professor of Humanities at Wesleyan University, has produced a tell-all of Diderot’s life from his writings to his numerous women, from his political activities to his close friendship with Catherine the Great, the Empress of Russia. He has done an excellent job. It is very well researched, leaving no stone unturned, covering all the territory of the times, both foreground and background, and it is learned and lucid. Diderot wrote a massive amount. For his famed Encyclopedia he wrote seven thousand wildly divergent articles. He had the ability, says Curran, “to bring together the most disparate realms of knowledge”—philosophical, artistic, political, social, and even scientific. Only half of his writing was published during his lifetime. The rest was consigned to a bottom drawer, to be published after his death. As a young man he was imprisoned for his outspokenness and didn’t want to be in a stinking French jail ever again. When he reached his sixties—old for the times—he had three copies of everything he had written and entrusted the first and most complete set to his daughter. He was a dedicated family man. His liaisons, as was common then among the educated and upper classes, and indeed today in France, didn’t seriously impinge on his family and marital life. If it wasn’t that Curran shows how thorough and exact he is from other chapters in the book one might not believe this. But it appears to be true. Curran sums up his talents, “playwright, artist, the art critic, the science fiction writer, the sexologist, the moralist, the father, the lover, and the political theorist and commentator.” Who else can you name who has achieved so much? Jonathan Power is a staff reviewer at New York Journal of Books.